Though “Impact investing” has existed in various forms for many years, the concept has gained substantial momentum in the past decade. Investors of all types – private and public sector, philanthropic and for-profit – are seeking solutions that achieve both a social impact and a positive return by investing in initiatives that are more sustainable and efficient. Many of these solutions are leveraging proven business practices, such as growing an earned revenue stream, in order to enhance sustainability and scale in new ways. The term “impact investing” is broad and encompasses a wide range of investor types and asset classes. Among many endowments, institutional investors and investment funds, the concept of impact investing generally refers to “Socially Responsible Investing” (SRI), or the aligning of investment dollars with a given organization’s ideals around Environmental, Social and Governance (ESG) practices. SRI typically places the importance of financial returns above or equal to the desire for social or environmental impacts, which often are achieved by various forms of either selective investment strategies (i.e., a fund focused on energy efficiency) or negative screening (i.e., omitting investments in tobacco, firearms and mountaintop mining). SRI practices are also increasingly stretching across asset classes, to include private equity, venture capital and alternatives in addition to traditional equities and fixed-income investments. 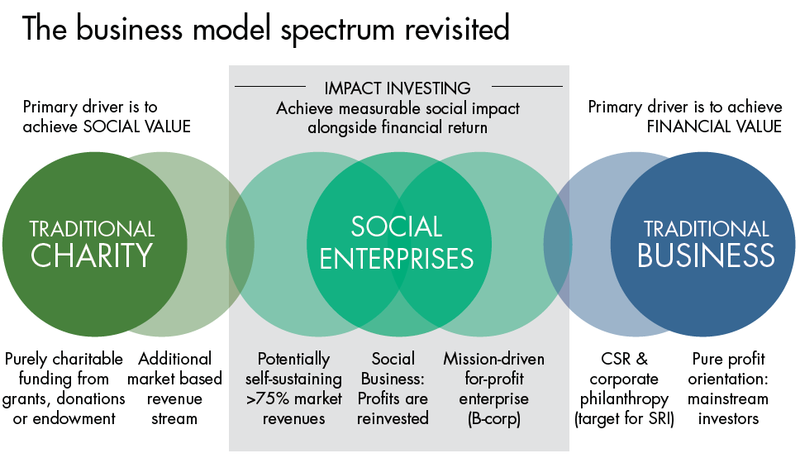 In contrast to SRI and ESG, place-based impact investing prioritizes generating a measurable social impact over obtaining a market-rate financial return. Many private angel and venture investors, community foundations, private and family foundations and public sector officials are approaching local social challenges through investing debt or equity capital, along with traditional forms such as grants. Many of these investments are subsidized, or below-market, and also range across all asset classes. The result is influencing a transformational shift in how local social challenges are addressed at the community level. Investors are actively investing in a range of business models that represent a continuum of strategies for achieving impact. The various models employed offer investors solutions to social issues that fit various levels of risk tolerance and return expectation. Environmental, Social and Governance (ESG) and Socially Responsible Investing (SRI) are tools to influence private companies by shareholders. ESG and SRI investors use several tools – such as negative screening to avoid industries harmful to society (e.g., non-renewables) and positive screening to seek industries net beneficial to society (e.g., renewables) – to influence their investment portfolio. ESG and SRI are not place-based impact investment tools, but they have deeply influenced the philosophy behind impact investing. According to a recent Vanguard report, global ESG and SRI assets under management total $22.9 trillion and are growing. Loans: According to the Global Impact Investing Network (GIIN), “private debt or fixed income is the largest asset class in impact investing, accounting for 34% of impact investors reported” assets under management (GIIN, 2018). Impact investments are generally subordinated and unsecured, providing borrowers with significant flexibility. Some impact investors will seek more preferential terms, like senior loans, which have the first call on any payment or assets in case a borrower is unable to pay on its obligations. Nonprofits and social enterprises can use debt capital for the acquisition of facilities, for the construction of new facilities or for equipment. It can be long-term debt. It can be short-term debt, bridge loans, meant to close the gap between a project’s financing needs and the receipt of revenue or grants. It can also come in the form of working capital or lines of credit. When properly managed, debt capital can be a powerful tool to drive social impact. Loan Guarantees/Credit Enhancements: Without making grants or loans, investors can leverage their balance sheets and credit to facilitate social impact by acting as a guarantor on a social enterprise. With guarantors, social enterprises can find more favorable terms on debt. Investor backing may, on its own, be able to lower the overall cost of loans. Investors can also provide credit enhancements – “first-loss capital” – to encourage other private investors to invest in riskier than ordinary deals. Fixed-income Securities: Several Community Development Financial Institutions (CDFIs), such as LIIF and the Reinvestment Fund, have begun offering S&P-rated “impact notes” that provide modest financial returns (generally 0.5-4.0%) over the course of 3 months to 10 years. Flexible Capital: Significant investments, generally made by a foundation or other source of philanthropy as a grant, to transform an organization’s operations are meant to catalyze impact. It can be change capital used to re-align an organization’s strategic priorities. It can be growth capital used to expand the reach of a social enterprise. It is meant to be used for relatively short term realignments in strategy. These investments frequently, but not always, do not seek any financial return. Equity investments, when compared with debt instruments, comprise a smaller share of total impact investments. Unless the investee generates a profit (and pays dividends) or there is a sale of ownership, the equity investment produces no financial return. These investments carry significant risk. Pay for Success (PFS) and Social Impact Bonds (SIBs) provide an innovative means to contracting whereby payment for service delivery is tied to the achievement of measurable outcomes. Contracts generally provide for a quantity of outputs, but PFS aims to improve the quality of outcomes. PFS contracts are difficult to structure because they require several actors: a service provider; a funder (such as an impact investor) who expects a financial return upon achievement of agreed upon outcomes; an independent evaluator who determines the effectiveness of a service in meeting its outcome objectives; and a payor (typically governments) who pays the funder, depending on outcome measures, the principal and return. PFS is an attractive new tool because it holds service providers accountable to baseline outcome measures and rewards more effective programs with higher financials returns. The first PFS project, which launched in 2010, successfully decreased recidivism in the United Kingdom. Since then, more than 100 initiatives have been implemented globally. New Markets Tax Credit (NMTC) Program is run through the U.S. Department of the Treasury’s Community Development Financial Institutions (CDFI) Fund. NMTCs credits are managed through Community Development Entities (CDEs) such as Invest Atlanta affiliate Atlanta Emerging Markets, Inc. (AEMI) and provide tax credits totaling 39% of the original investment amount over a period of 7 years. NMTC projects have to be located in a designated qualified low-income community. PolicyMap can be used to determine eligibility. Low Income Housing Tax Credit (LIHTC) Program provides dollar-for-dollar tax incentives to private or nonprofit developers to create affordable housing. Tax credits are provided to states and distributed to developers by the state’s designated authority. In Georgia, the Department of Community Affairs manages its distribution. There are two types of LIHTC – 9% credits, which are typically used for new construction, and 4% credits, which are typically used for renovations – that last for 10 years. Opportunity Zones (OZs) were created in the 2017 tax bill and the program is awaiting final regulations from the IRS. Proposed regulations were published for comment in mid-October 2018. The roughly 9,000 OZs encompassing 35 million Americans created through the program will attract investors, if implementation is successful, by  deferring capital gains taxes until 2026 or withdrawal from an opportunity fund,  reducing capital gains taxes by 15% after a 7-year OZ investments and  permanently excluding new gains derived from an opportunity fund if the investment is held for 10 years. Program-Related Investments (PRIs) are codified in the 1969 U.S. Tax Reform Act and provide a means for private foundations to create blended value, financial and social returns. While private foundations are guided by the 95/5 rule, whereby they must donate 5% of their assets per year to enjoy their tax privileges, the law counts PRIs as a philanthropic endeavor, counting it as part of the 5% because their associated favorable terms for borrowers (e.g., subordinated, low-interest rate debt). PRIs provide for greater recycling of capital through social good projects, financing of larger, high-risk capital projects, and more flexible debt and equity positions available to social enterprises. Mission-Related Investments (MRIs), like PRIs, are investments seeking blended returns. Unlike PRIs, MRIs seek financial returns on par with market-rate returns. MRIs are not codified in law. The Community Reinvestment Act (CRA) is intended to encourage banks to help meet the credit needs of the communities in which they operate. It requires that each institution’s record in meeting the credit needs of its entire community be evaluated periodically. Qualifying activities include: investing in Community Development Entities (CDEs) and Community Development Financial Institutions (CDFIs), supporting minority- and women-owned financial institutions and low-income credit unions (MWLIs), serving as a joint lender for a loan originated by MWLIs, facilitating financial literacy education to low-income communities, operating branches in low-income communities, providing low-cost education loans to low-income borrowers and offering international remittance services in low-income communities. CRA is associated with a degree of controversy due to higher-priced loan products possibly receiving CRA credit, but it also facilitates significant small business lending and community development in MWLI communities. Over the course of several months, GSIC engaged Advantage Consulting to survey the ecosystem of social impact entities in Georgia. The report launched in June 2018 with unsurprising results: 44% of Georgia’s investors are looking for deals based in the state, and 78% of Georgia’s social enterprises are actively looking for capital. Learn more! Impact investments can take many different shapes and forms. Continue reading below to learn more about investment vehicles you can leverage as an enabler, enterprise, investor or intermediary. The Global Impact Investing Network (GIIN) is the global champion of impact investing, dedicated to increasing its scale and effectiveness around the world. The Case Foundation creates programs and invests in people and organizations that harness the best impulses of entrepreneurship, innovation, technology and collaboration to drive impact. Their efforts to drive social change are focused on three key pillars: revolutionizing philanthropy, unleashing entrepreneurs, and igniting civic engagement. USAID’s Center for Accelerating Innovation and Impact (CII) takes a business-minded approach to fast-tracking the development, introduction, and scale-up of health interventions that address the world’s most pressing health challenges. CII invests seed capital in the most promising ideas to cut the time it takes to transform discoveries in the lab to impact on the ground.